Installation:Measure and clean the area where the shade sail is to be installed. Leave an allowance of 1.5-2ft between the fixing point and the shade sail to fit hardwares/ hooks or ropes. Maintenance Clean with mild detergent or water, do not scrub it with a stiff brush, do not put it in your washing machine, clothes drier. Shade sails are ideal for indoor and home outdoor areas - covering pools, lawn,garden, patio areas, garage and spa's. Please note that shade cloth is a material can shrink, usually it need tolerance for +-6 inch for each side, thank you. Please read the installation guide carefully to ensure good installation and use. It will be better to pack shade sails up when there is no need to use them. Due to the light, pictures here might has a little difference with products. MONEY BACK GUARANTEE We think you're going to love our sun shade sail as much as we do. But in case you don't, just return it within 30 days for a full refund, no questions asked. HIGH QUALITY MATERIAL: Our sun shade sail is made of 100% new UV protected high density polyethylene (100%HDPE) shade fabric with strong stitched seam and durable stainless steel D-rings in each corner. UV PROTECTED SHADE SAIL: 90% high density breathable blockage, while effectively reducing heat, block up to 95% of UV rays, protect children, flowers, plants, cars from backed in sun. OPTIMUM VENTILATION: The breathable fabric design allows cool air to penetrate the shade sail providing an airy, comfortable, and well-ventilated space. EASY TO INSTALL: With durable stainless steel D-rings in each corner make the sun shade sails easily attached to any sturdy connection point. 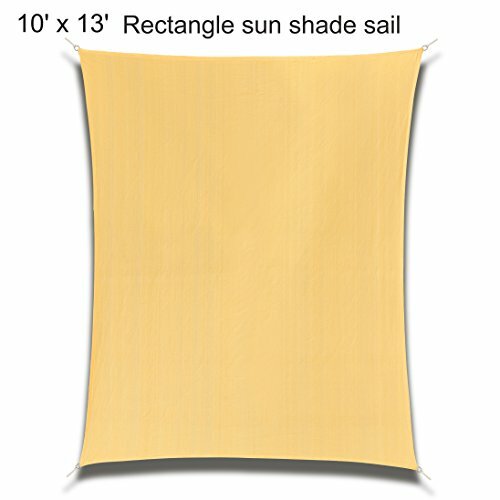 VARIOUS USAGE: This shade sail is widely used for a patio, lawn, garden,swimming pool, BBQ areas,pond, deck, kailyard, courtyard, backyard, dooryard, park, carport, pergola, sandbox,driveway or other outdoor. Vanteriam Waterproof Bench/Loveseat Cover, Large Outdoor Furniture Covers Waterproof for Loveseat/Bench.